Our Mecha'thun Priest deck list guide features the best Rastakhan deck list for Season 61 of Hearthstone (April 2019). Our Mecha'thun Priest guide also contains Mulligan advice, card combos and strategy tips. Mecha'thun Priest was one of the exciting new Hearthstone archetypes to emerge in the new Boomsday meta, and it is of course based around this fascinating new card. The idea behind playing this deck is to both play and destroy Mecha'thun on the same turn, in order to ensure that the Mech's Deathrattle obliterates the opponent in one fell swoop. This requires a very specific combo play, and in our guide to playing this deck we've explained exactly how you go about achieving this. We've got a very strong deck list for you to get started with, some Mulligan tips, an overview of the strategy involved in playing the deck, and a teardown of the combos. We had a lot of fun with Mecha'thun Priest in the early days of the expansion, and although it's not particularly competitive in the Rastakhan meta it's still a blast to play. We'll keep tracking the deck and will make sure we're always highlighting the strongest version of it on Metabomb. Very few changes have been made to Mecha'thun Priest since the launch of The Boomsday Project last August, and indeed there's nothing new for the archetype in March! This one sits way down the tier list, so don't expect a brisk climb if you're determined to be a crack of it. Huge thanks to James Pickard who has provided a lot of the enhanced insight that now exists in our guide. Mecha'thun Priest is a whole new deck archetype that has emerged with the release of The Boomsday Project. It’s a very unique deck that’s centered around the Deathrattle effect of the Mecha’thun minion, which will trigger and destroy the enemy hero if you have no cards in your hand, deck or battlefield. At first it doesn’t sound like the easiest situation to orchestrate, but the deck building wizards have already put this together to some success. Priest is the perfect class for the job as it has enough draw and healing to get through the deck quickly while also keeping itself alive. You have cards such as Hemet, Jungle Hunter that play a large part in chewing through your deck. But the most important finishing combo is Reckless Experiment with Coffin Crasher, the pair of Ticking Abomination and Mecha’thun, which can bring the massive ten mana minion onto the board for free and then immediately wipe out the board to trigger the card’s effect. There’s still room for refinement but Mecha’thun Priest is already showing a lot of early promise. Early game: From the off you’ll mostly be finding ways to draw cards and dealing with your opponent’s early aggression. Northshire Cleric, Loot Hoarder and Acolyte of Pain are all great for the former, while the latter can be handled by healing or removal through cards such as Wild Pyromancer and Spirit Lash. Late game: Now you’ll want to find the right time to execute the deck’s win condition – probably Turn 10 or 11. Until then, look to use Hemet, Jungle Hunter, which can discard a huge portion of your deck when played. Fortunately, none of the cards that are affected by it play an important part of the winning combo. It is indeed desirable to thin your deck so that only the most important late-game cards can find their way into your hand. Then it’s all about dropping Reckless Experimenter, Coffin Dodger and both Ticking Abominations - in that exact order - on the same turn together. The Coffin Dodger dies first, summoning Mecha’thun onto the board. The Reckless Experimenter then causes the Ticking Abomination minions to die, which kills first of all the Experimenter, then themselves, and then finally Mecha’thun. 1. Aggro decks can be one of your toughest matchups as their speed can sometimes race you down before you can set up the combo, making Hemet, Jungle Hunter a vital part of the deck’s success. 2. Pair Wild Pyromancer with your spells to create powerful board clears that can give you some breathing room against aggro. 3. You’ve also got a good amount of healing to help you survive against their aggression with your Hero Power and Divine Hymn. 4. Shadow Visions is a good card to help find the spell you need for the situation, whether it’s a clear or some more healing. 5. Psychic Scream is vital for pushing back against aggressive decks, resetting their position as you build towards your game-ending combo. You have slightly more time to get the combo together against slower control decks so don’t feel you need to rush card draw quite as much. All the same, if you can set up a scenario where you can draw multiple cards with Northshire Cleric and Circle of Healing then you should definitely go for it – just be cautious of over-drawing. Psychic Scream is hugely impactful against control sending absolutely everything on the board back into your enemy’s deck. The deck runs a single copy of Silence which is worth saving to nullify your opponent’s most troublesome minion. You’ll want to be particularly cautious of decks that can force you to draw, discard or alter cards in your hand. Warlock decks with Gnomeferatu and Demonic Project could spell disaster if they hit important combo pieces. These are the cards you’ll want to search for in order to get your game off to the best possible start. 1. Northshire Cleric: An annoying one drop that can offer some early game draw to get through your deck faster. 2. Loot Hoarder: Another good minion to contest the board that also cycles through your deck. 3. Hemet, Jungle Hunter: Vital for cutting a huge chunk of cards from your deck that brings you closer to your win condition, so always worth holding. 4. Power Word: Shield: Buffs minions to make better trades while also drawing further through your deck. 5. Acolyte of Pain: Again, it’s more card draw, and the quicker you can get your draw pile empty (without burning the wrong cards) the better. Here's an overview of all the most important card combos this exist in this exact version of Mecha'thun Priest. If the deck list changes over time we'll update this section so that it remains relevant. - Northshire Cleric draws a card for each minion that gets healed during a turn. If you can combine this minion with cards like Wild Pyromancer and Spirit Lash (or other healing spells), and Acolyte of Pain then you have the potential to draw a fair chunk of cards. - All spells cost one Mana less for as long as Radiant Elemental remains out on the board. This can be a very useful way of empowering the card-draw plays outlined just above. - Bloodmage Thalnos causes all of your spells to have an extra point of strength, and also draws you a card when it dies. - Every time Acolyte of Pain takes even a point of damage, he'll draw you a card. Keep this character healed up as best you can to keep that draw train rolling. 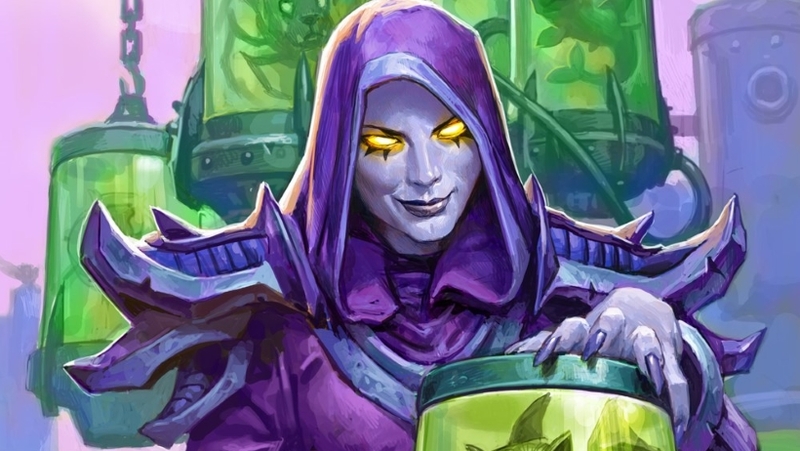 - You should not spend Reckless Experimenter, Coffin Crasher, Ticking Abomination or Mecha'thun as anything other than a part of the combo that we've outlined in the strategy section. These cards represent your win-condition. While Mecha'thun Priest is still going through serious refinement the deck list could be changing on a fairly regular basis. However, these are some of the key pieces to make it work. Northshire Cleric: Priest’s most powerful draw engine. You can get more value out of it with a buff from Power Word: Shield. Bloodmage Thalnos: Card draw on death is nice, but the spell power can also be handy when combined with Spirit Lash for board clears. Ticking Abomination: Get the pair of these to trigger at the same time and you’ll not only destroy Mecha’thun but the rest of the board too – and win the game. Reckless Experimenter: Makes your Deathrattle minions cost three less but will also destroy them at the end of the turn. This is a crucial component of your OTK play. Coffin Crasher: Another part of the combo that you really can’t do without in this deck. Hemet, Jungle Hunter: Can be hugely impactful by discarding a good two-thirds of the deck in a single blow and bringing you much closer to your win condition quicker. Psychic Scream: Massive removal effect that’ll disrupt the plans of any opponent that has a strong board position against you. Mecha’thun: The card the deck is built around. Has a very specific set of conditions to trigger but this Priest list has ways to make it happen with some reasonable consistency.